My blogs about of lying have generated a tremendous response. It seems everyone has been affected one way or the other by lies. 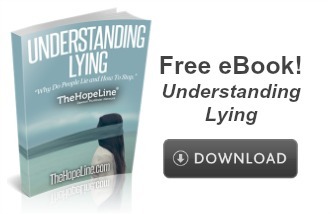 Everyone agrees lying is a destructive habit that hurts you and everyone around you. This week, I want to talk about the powerful and damaging effects of lying. So how does lying hurt all of us? Everyone agrees that lying hurts you and everyone around you. If you’ve ever been lied to, you know how difficult it can be to ever trust that person again. You can’t help but wonder why a friend or family member would treat you so poorly. I received a comment from Brooke, who said:My dad lies to us (my brothers and I) about going out to bars and drinking. He doesn’t think we will find out but he is always wrong! I tell him how much it hurts us each time he does lie but he just keeps on lying. The worst lie he has told me was that he was with my brother and not at the barbut I was with my brother. When you lie, even if you think others will never find out, you will almost certainly create a barrier of hurt in your relationship. Rebecca said: I am a single mom of a teenage daughter. Her continuous lies have created a huge barrier in our relationship. I always catch her in lies and it hurts. The lying escalated to sneaking around doing things with friends I don’t approve of and that hurts. Unfortunately, when the other person finds out about your lying, and they usually do, it’s nearly impossible to regain trust. This has been Ally’s experience. She said:Once someone has lied to you, it somehow always happens again. Unfortunately, when the other person finds out about your lying, and they usually do, it’s nearly impossible to regain trust. Jessie said: When I was little, I told lies all the time, and never felt guilty about them. But then something happened that I needed to tell someone about, and nobody believed me. My early lying paved the way for years of heartache. Now, I never lie. Ever. It’s just not worth it. When you need the trust of others that you’ve lost, it’s the worst feeling in the world. So what do you want your relationships to be based on? Lies that you tell, in order to protect yourself, or to avoid conflict? Or do you want relationships to be based on a commitment to honesty and integrity, regardless of the hard times? It’s up to you to decide. When you lie, it’s like putting a giant rock on your back and having to carry it around everywhere you go. When you continue to lie, it’s like putting a giant rock on your back and having to carry it around everywhere you go. It is a relationship destroyer that ends up destroying you. A fellow blogger wrote to me about his problem with lying: I have a lying problem and it has been causing issues ever since I was a little kid. The worst part is how I have to constantly break ties with people so I won’t get caught in the lies I’ve told. So time and time again I find myself all alone, with no friends and a lot of places I have to avoid. And I can’t even blame anybody else because it’s my fault for telling those lies in the first place and then not being able to face up to them. Lying destroys us because it takes us into a vicious cycle that is extremely difficult to get free from. Once you tell a lie, you usually have to lie again to cover up the first lie, and you feel even worse. Steven H. said: Lies grow, they never stand alone, they need more lies to support the first lie. So, if you don’t fess up immediately…it grows like a cancer. It cannot be stopped. It’s time for you to make a bold decision to never let lies have any part of your life. People who are trapped in a cycle of lying become controlled by fear – a fear of not only being found out as a liar, but also having the truth uncovered about themselves. Jordan said: “I’ve lied to my parents a lot. The know almost nothing about me, except for who I pretend to be. I wish I could clear the air with them but I know they wouldn’t accept the true me, so instead I lie to please them. I wish I had told the truth.”Jordan fails to understand that he can clear the air with his parents and have the freedom of walking in the truth. It all comes down to this: Lying comes with a huge cost – it destroys lives. Relationships will crumble and people will refuse to trust you. But the person most hurt by your lying is you. It’s time for all of us to make a bold decision to never let lies have any part of our lives. Are you up for it? When i was a kid i used “white lies” to make others less worried and to avoid conflicts. I was afraid to ask for a support from others always try to do myself everything. I believe there is work for parents with kids- not to get angry with their mistakes but support and teach them. Now in my adults life i done a terrible mistake and lied to my friends and only now i realise how important is trust in relationships cause it’s not easy to fix. I knew lie has short legs and it’s nothing new. And my belief is – your inner child always learn from experiences.It’s all good to suffer-to feel-to forgive-to love. We’re humans and we learn all life isn’t? not true. if proven your actions and stopping a habit you will eventually re-earn trust. no matter what happens your family and friends will always be able to help you and will always love you. speaking from experience this coment is very hurtful to people who are trying to break this habit and only encouraages them to stop. please dont bring others down and always think positive ! Havent you heard the old saying “One lie can ruin a thousand years of reputation!” My ex lied constantly about everything and i stayed for the sake of our son whom i took care of while she left to “work” everyday. Got to the point i avoided talking to her and gave simple answers to her when i had to. Aweek ago she left with our son and wont let me see or talk to him, she said it was all my fault because i wouldnt pay attention to her anymore. Now im paying for it i lost my whole meaning to life my son! I am hurting but at the same time im liberated point is it is destroying my son! NEVER LIE its more damaging than most people believe.